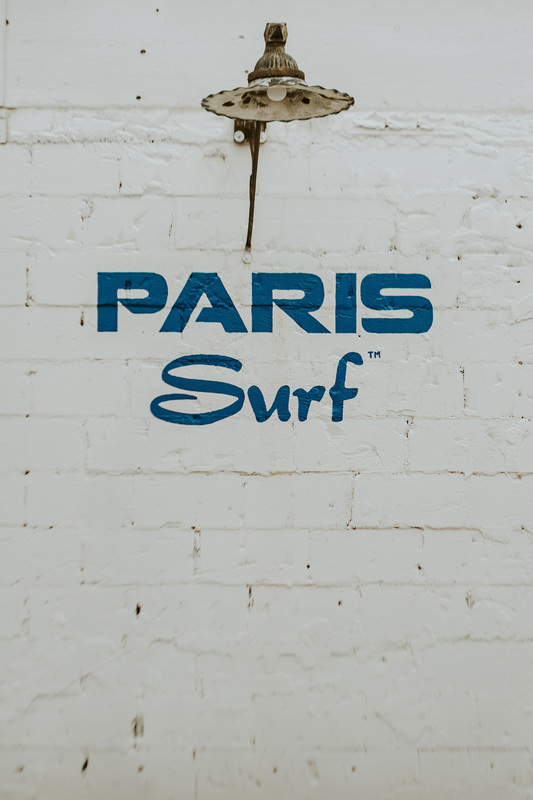 Paris Surf doesn’t have any business being in Paris, Ontario. It is 500 miles from here to the nearest ocean coast, and any fashion district with a tolerance for neon is at least 1.5 hours away. 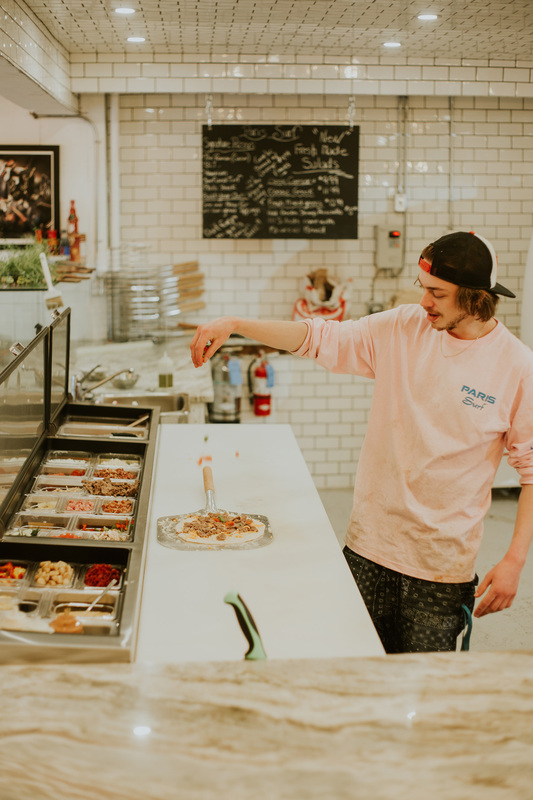 The combination of denim, pizza, juice and coffee bar – and beer – is the daring business model of a larger city somewhere else, yet this fledgling brand is here, and its potential to change things is vast. Do you appreciate our content? We are trying something new – support us on Patreon with a few bucks a month to help us keep this blog going. 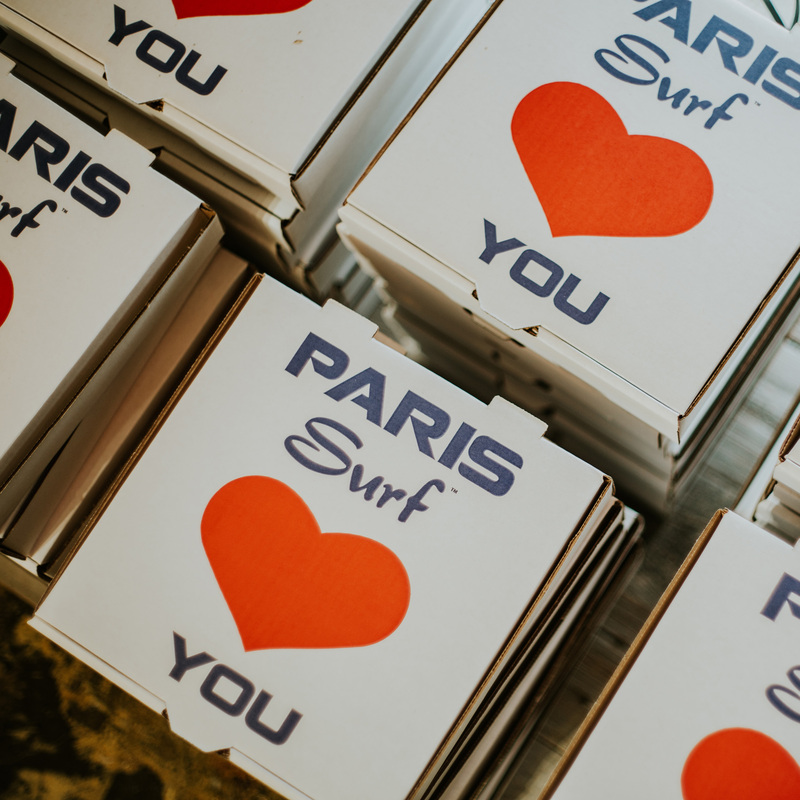 Our Paris Surf pizza fund appreciates you! 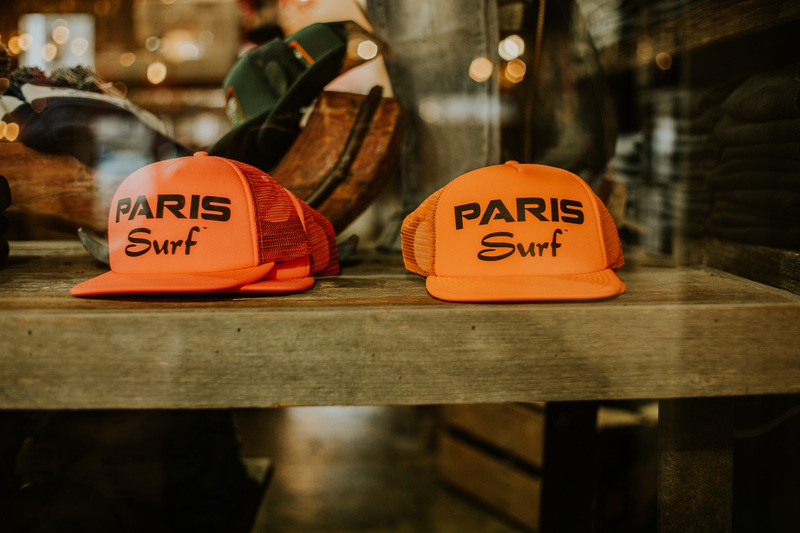 To find Paris Surf, veer off the main road in small-town Paris to Mechanic Street, an area recently revitalized by the opening of the Wincey Mills market and made even more interesting by the arrival of Paris Surf. 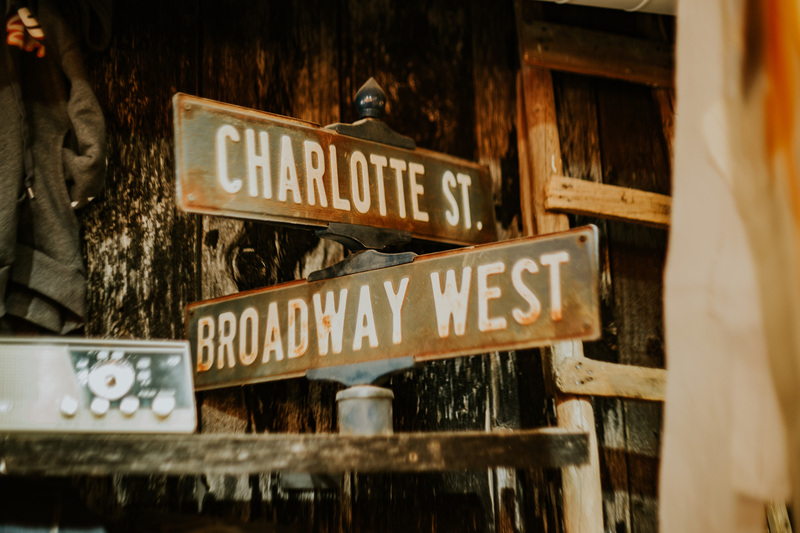 Long ago this part of downtown was occupied by factories known for producing itchy, unlikeable “wincey” fabric, the material of choice for Canadian military uniforms. In more recent decades Mechanic Street was home to a large scale Canadian Tire, the New Royal Hotel and the Capitol movie theatre, none of which exist there today. The Royal building will soon be torn down and reborn as upscale condos. But that’s a future that isn’t here yet. 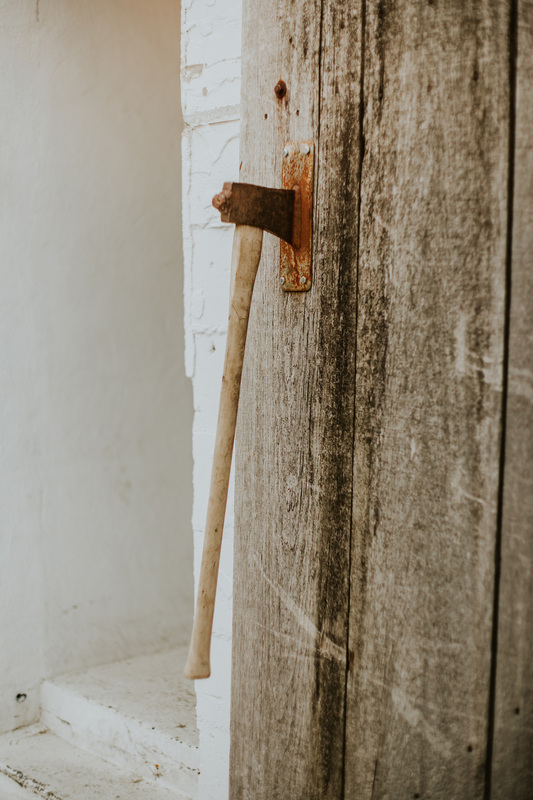 Meanwhile, Paris Surf sits kitty corner from the Wincey Mills, its whitewashed brick exterior emblazoned with its 90s-esque logo and an axe for a door handle long before it officially opened. 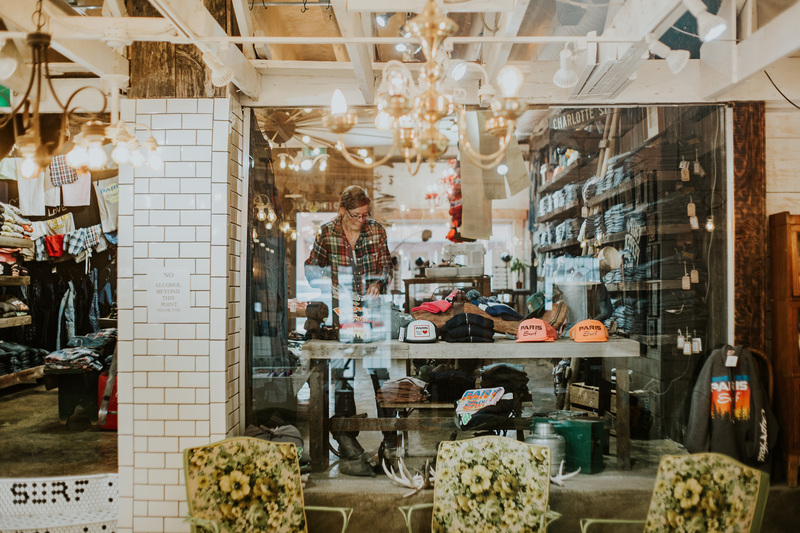 It is positioned conspicuously between a traditional florist and a housewares shop in the same strip as two small thrift stores, where on any given day it optimistically blasts music out onto the unsuspecting street. Anyone who has been to Paris in the last decade might likely wonder, what the hell is this place doing here? Inside, the venue is comfortable and cool. 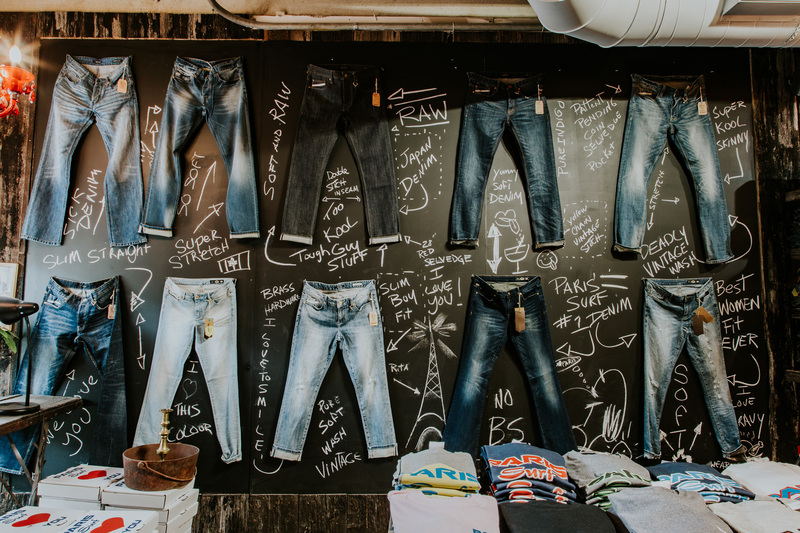 The front retail space has walls and tables stocked with tons of quality, locally-made jeans (you get what you pay for at 200 bucks a pop! ), t-shirts, hoodies, and the more affordable hats and socks. 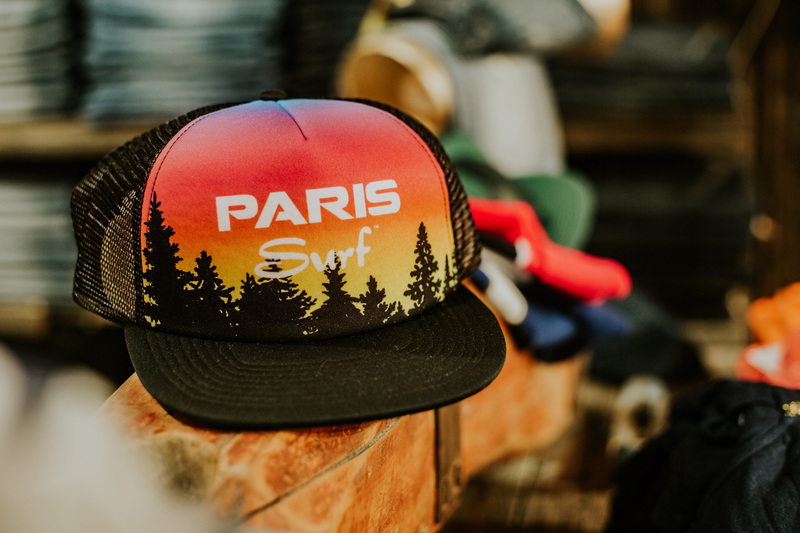 They all feature the Paris Surf motif, a badge of honour in blazing neon glory. 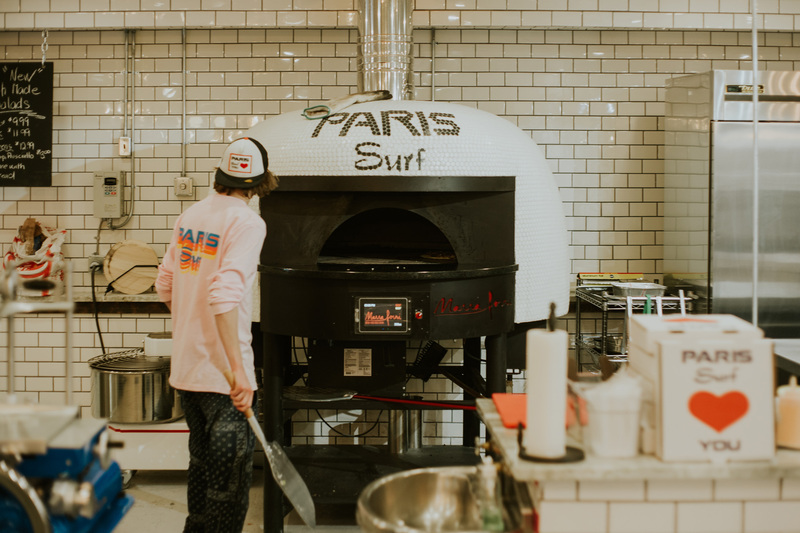 Through to the back where there is an additional entrance is a large pizza oven with custom tile that spells out Paris Surf, a wide granite bar ready with machines to concoct smoothies and specialty coffee, a deep cooler with ice and beer, cozy seats and novel decor. 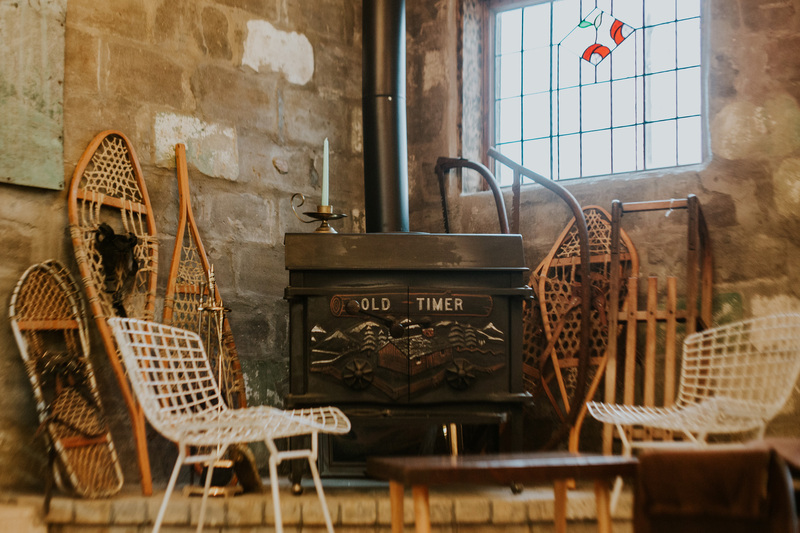 A canoe from Portland, Oregon has been converted to a long table and sits in the back, where who knows who you may find yourself sitting next to as you stuff your face with pizza and drinks. 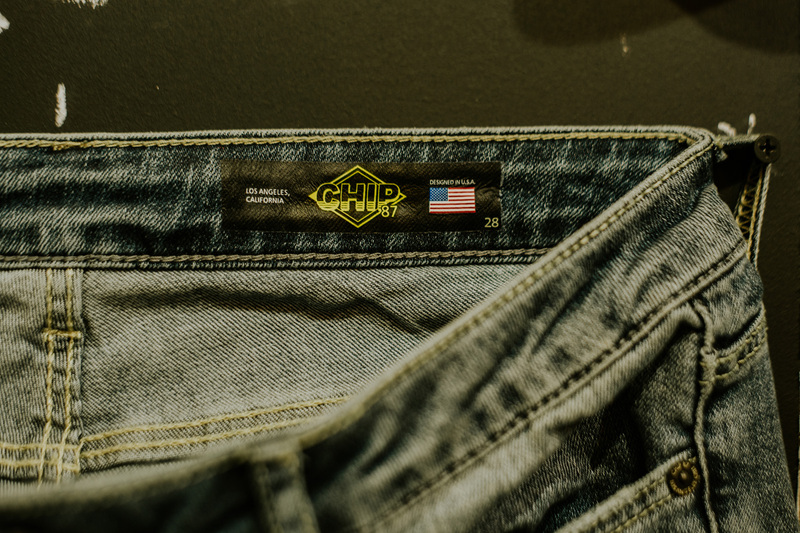 All of this is the brainchild of Chip Foster, the upbeat, long blonde haired visionary designer who with his identical twin brother, Pepper, founded a denim franchise in the 80s that remains popular with celebrities. 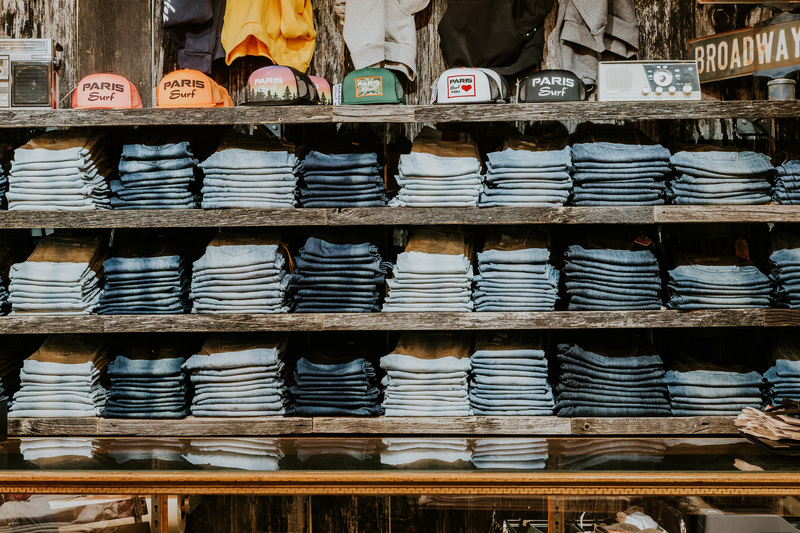 Originally from Winnipeg but having spent some formative years in Burlington, the twins moved to California where they sold jeans out of a van and established their reputation for in-depth knowledge of denim production. 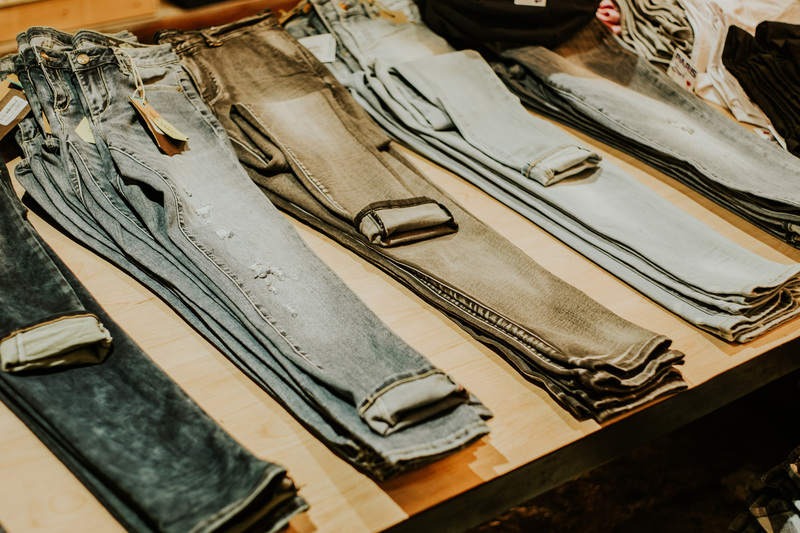 Still their products strike a chord with the likes of Jessica Alba, Kate Hudson, Naomi Campbell, and Matthew McConaughey. To homebodies like us it is all slightly surreal. 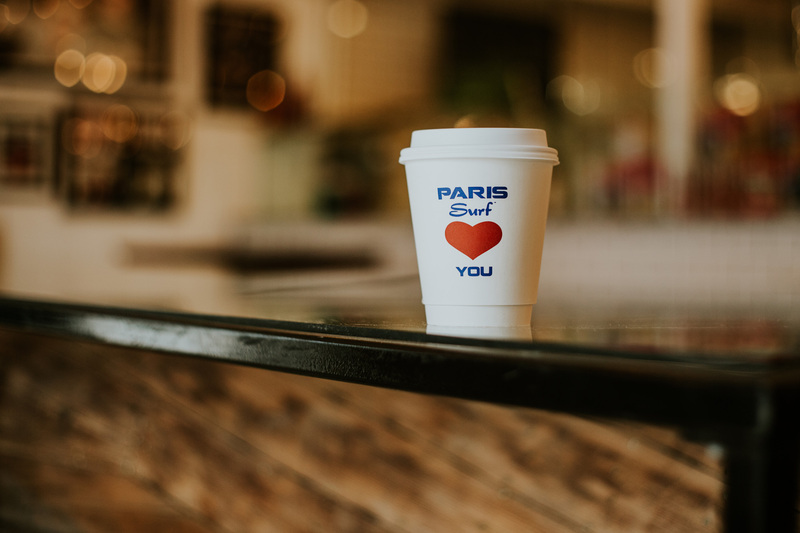 But truth, in our experience, is usually stranger than fiction, and the bizarre arrival of Paris Surf is not so bizarre when you look closely enough. Though Chip mostly works out of L.A. it is his children that anchor him to the area. A frequent visitor to Paris over the last fourteen years, he recently bought a home in Glen Morris and his kids attend school in Brantford. 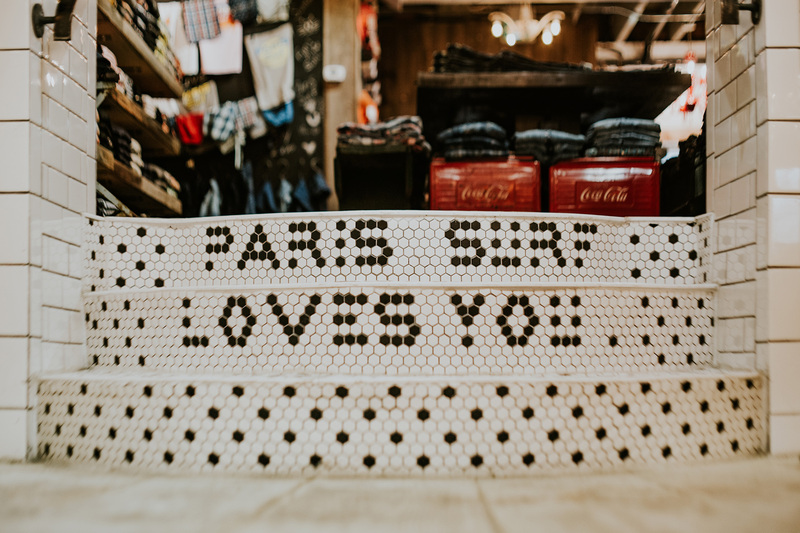 Paris Surf is his local raison d’être, a part of him, he says, that his three kids can always have nearby. 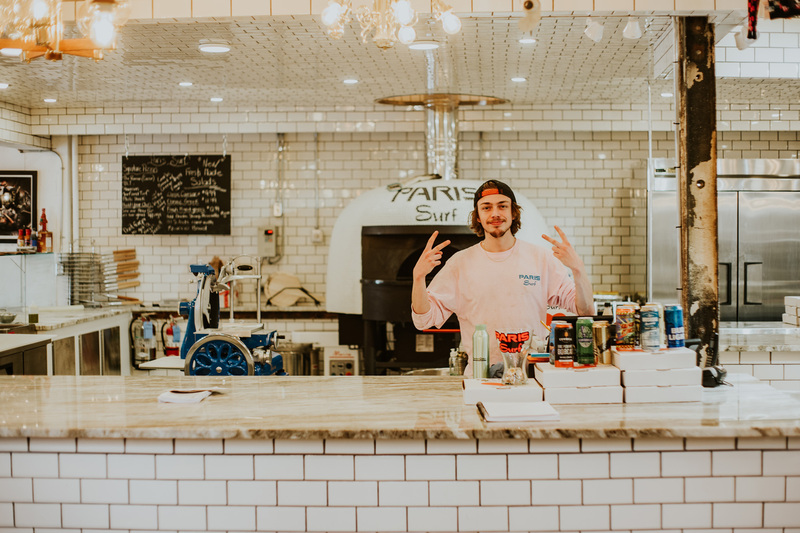 A place they – and of course he and others – can go to relax, hang out, enjoy great pizza, feel welcome, and let loose. In Chip’s words, something to eat other than chicken wings. 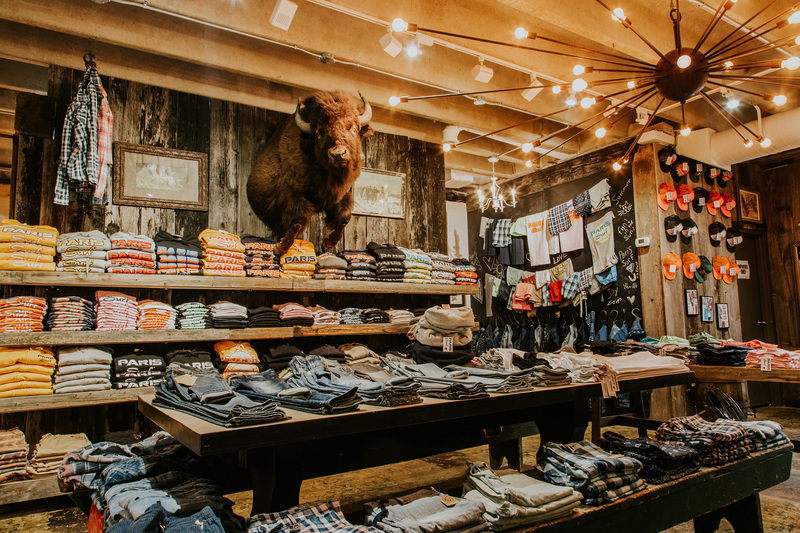 Somewhere to shop other than Winners. 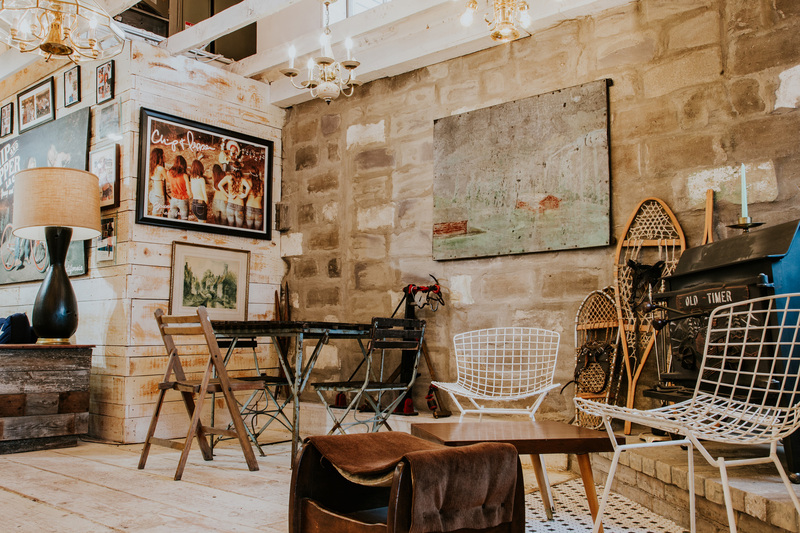 It occurs to us that this is the first time a commercial space in Paris has been​ designed with youth in mind, but at the same time it doesn’t exist solely for young people. 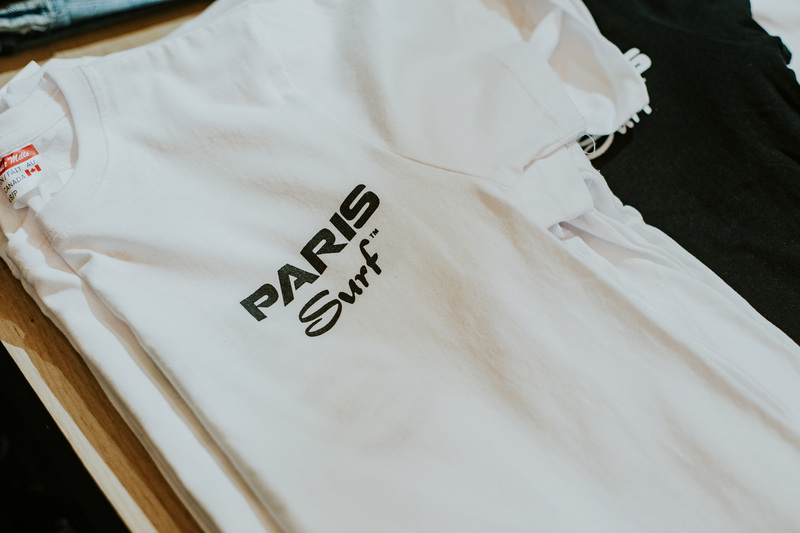 The vision for Paris Surf is to become an internationally recognized brand, and Chip seems to be sparing no expense or energy to get there. 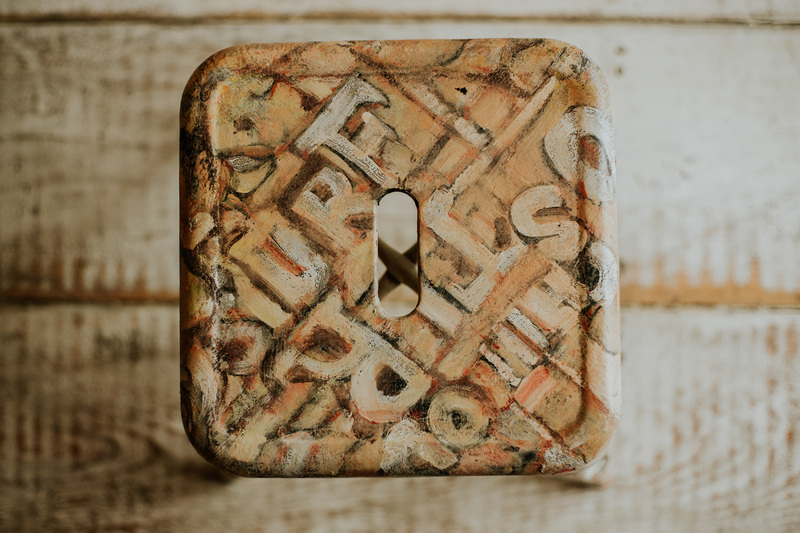 Many of the fixtures come from local Habitat ReStores, but others are sourced from Italy, Japan, and Laguna Beach. 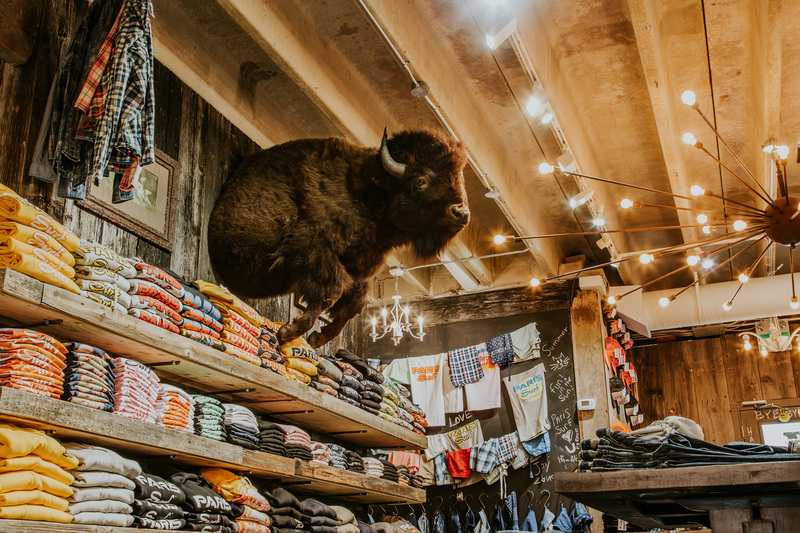 This shop is an experiment in the future of fashion and the brothers believe they’re onto something, a trend toward experiential shopping that big box stores are bound to replicate. Beneath its unassuming facade is a million dollars’ worth of merchandise. 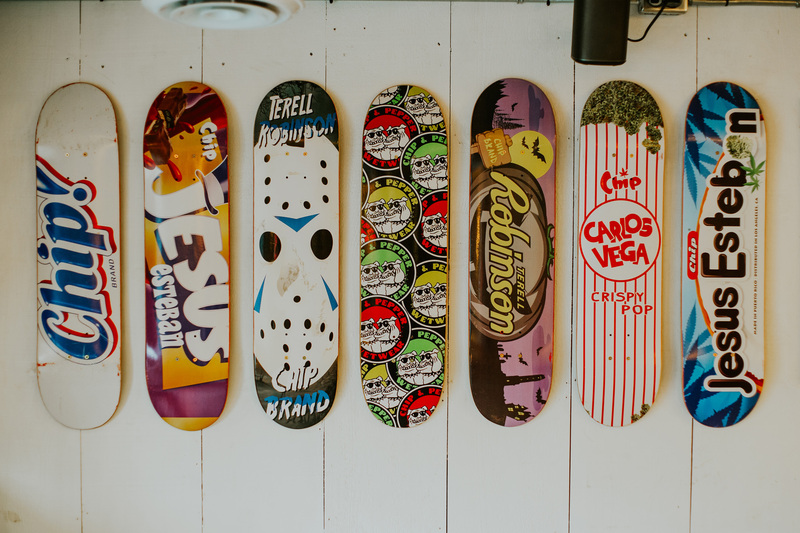 The basement is fully stocked in preparation for the opening of an online store to be launched alongside the shop’s Grand Opening sometime this summer, during which Chip’s new Paris Surf tractor will definitely make an appearance, along with maybe Ryan Gosling… Chip confessed that after sales four times their original projections they are already considering a second location in Malibu. Having bought the entire building, which includes McCormick Florist, there is also a possibility for a neighbouring brewery. 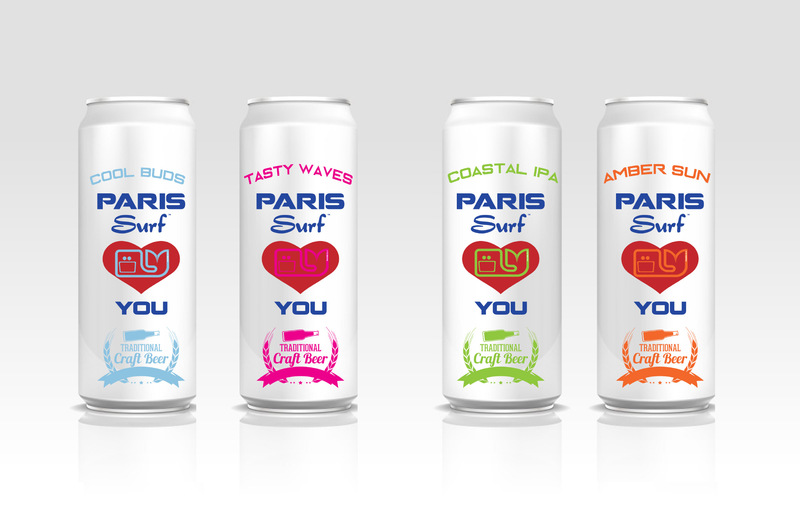 There are no timelines attached to that plan, but the product – Paris Surf beer – is shaping up into a reality. The ostentatious brand feels out of place in our historic downtown. 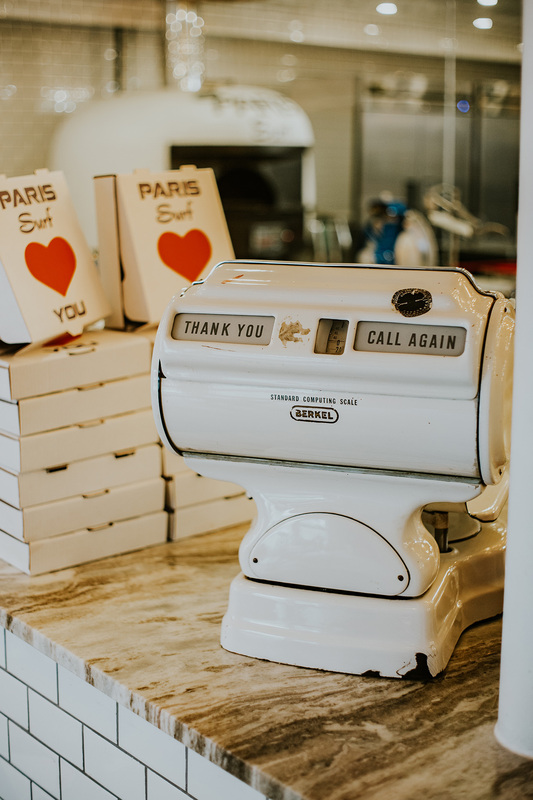 It is such a contrast to our very first experience of walking into the Little Photo Lab, the business that used to be where Paris Surf is now. During that initial visit, obviously prior to any renovations, the previous owners had the radio on and as Mark had his passport photo taken we talked about how difficult it was to get reception in the valley and how on summer afternoons you could hear the thuds of the kitchen factory up on the hill echo through downtown. That quiet and rhythmic life would have been the reality for many, many years. 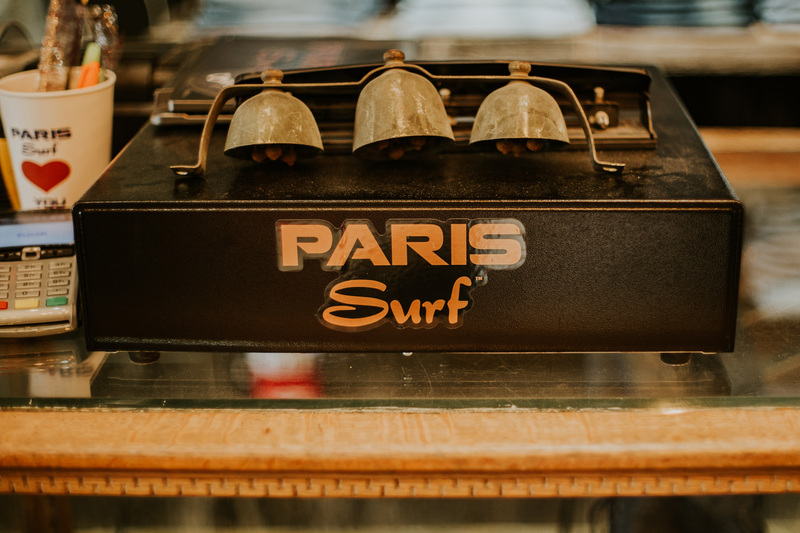 But the fact that Paris Surf is not the same is exactly what we like about it. It is gutsy and fresh and it unselfconsciously demands we pay attention to it. Isn’t it the truly interesting ideas that challenge us and also end up changing us? 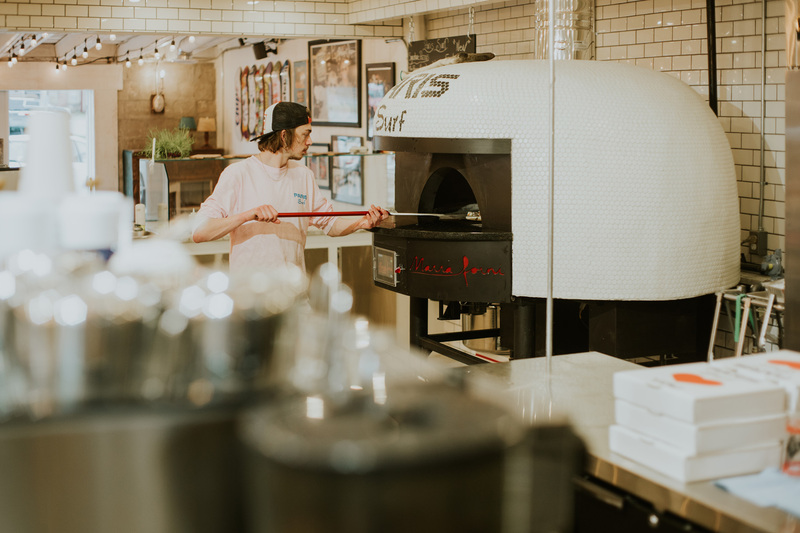 In recent years the town has seen the renovations of The Arlington, the Dominion Telegraph Centre, Stillwaters, The Wincey Mills, and the upcoming Bawcutt Centre – all of which contribute to a radical transformation of the town and growing possibilities for its people. 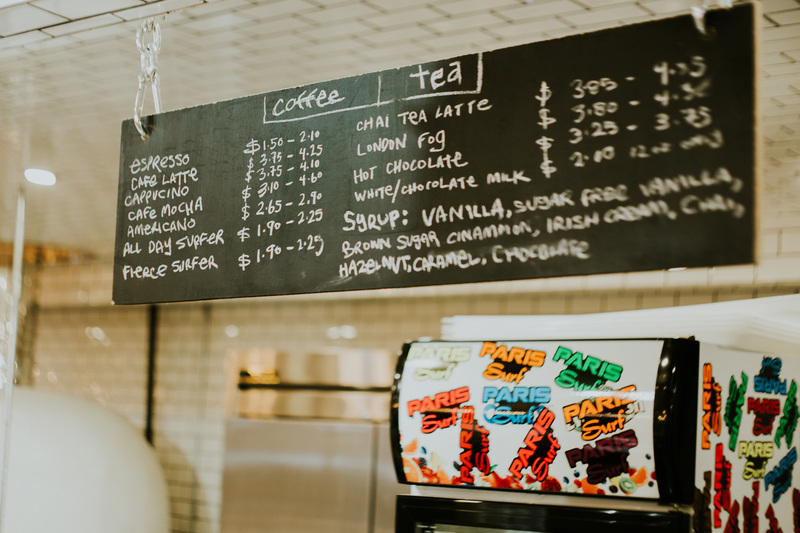 Jack Wordtmann is a Paris local who works as a manager at the new store and says he remembers what a big deal it was when the town got its third Tim Hortons on Rest Acres Road. 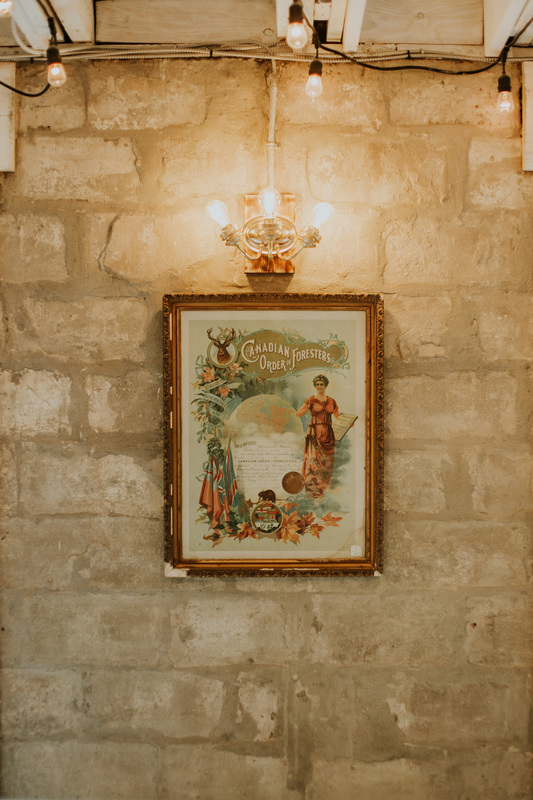 He’s convinced that within five years Paris will be a gastronomic destination. These small graces don’t go forgotten and the invitation is explicit. 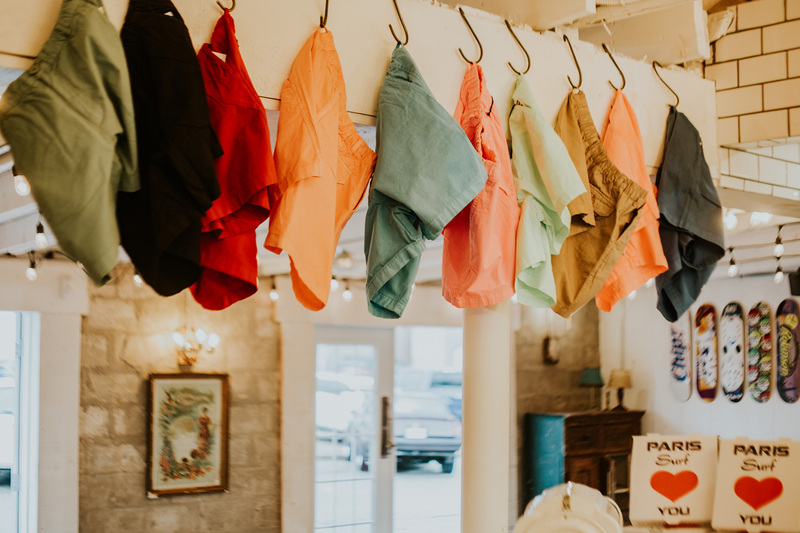 Whether you have muddy farming boots, trendy city sneakers, or are trudging in with a half broken stroller like us, we have seen Chip treat people exactly the same. That is, with a welcoming enthusiasm and energy of someone who loves what they do. 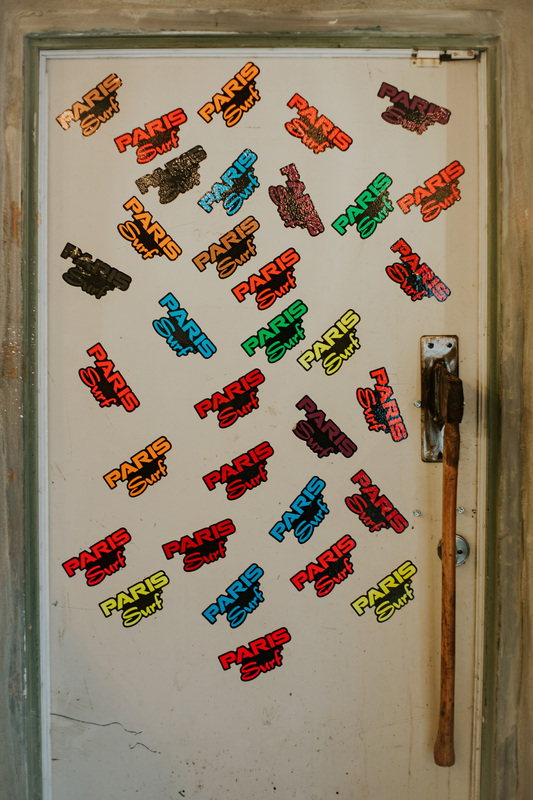 We’re hoping that not only does Paris Surf stick around, but that this psychedelic, optimistic spirit bleeds out into how our little town sees itself and imagines its future. Did you like this post? Help us keep making things like this. Support us on Patreon. Well done guys! Love your insights and views, and they’re always bang on. Cheers! Pair Surf is ostentatious at best. I have not tried the food, but find the clothing overpriced and gaudy. The whitewashed view from the street does not fit in with the rest of Paris. The denim is great. The shirt and sweater designs are just simply unthoughtful. 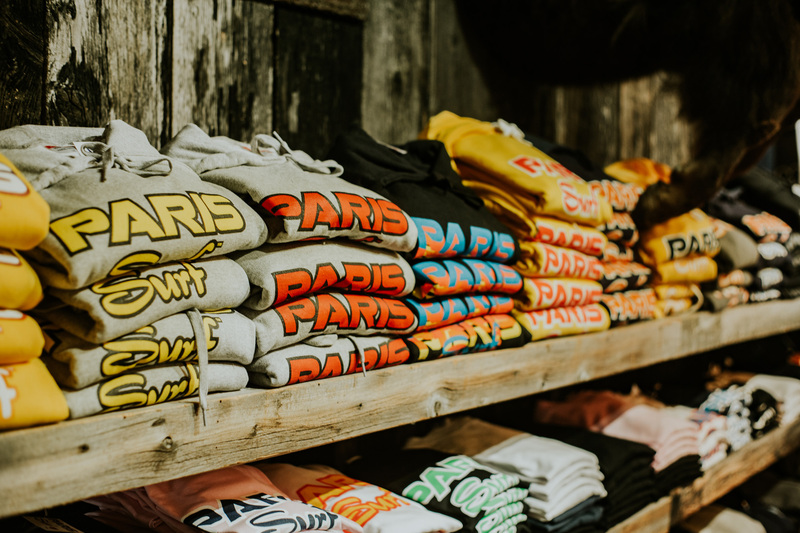 The last few decades of countless surf lifestyle brands have already laid the groundwork for this kind of fashion, so it’s way too easy to draw logos that fit that aesthetic. 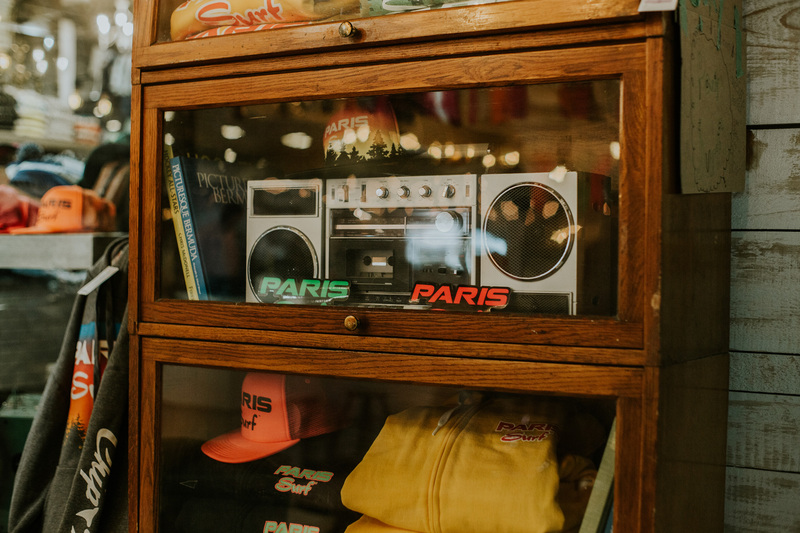 Paris Surf is trying to communicate that the surf scene is still relevant in today’s fashion world, but there’s nothing really appealing to the modern eye other than some cheap nostalgia. I will try the food soon. Food is amazing, Had the Hawaiian pizza and it had avocado, it was delicious. 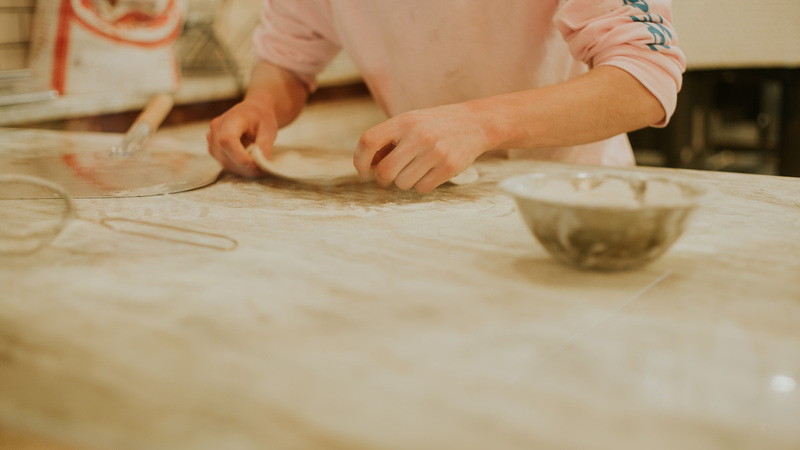 The dough is made right in front of you so its super fresh. 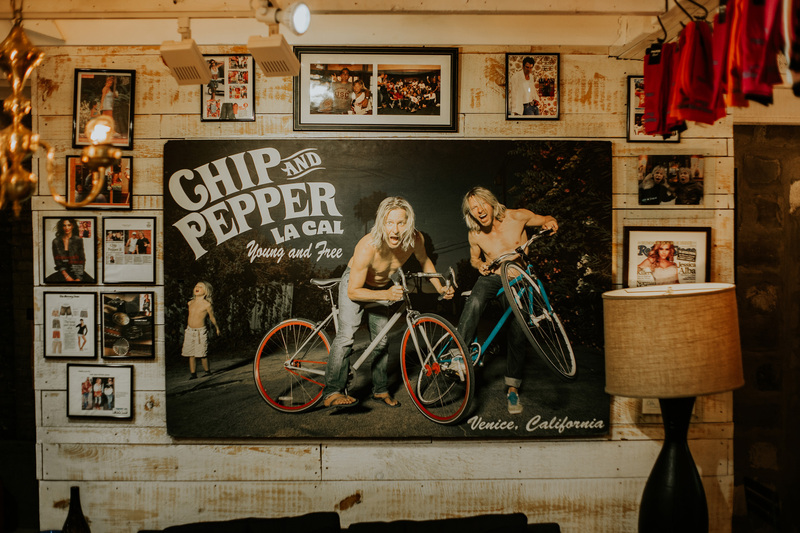 The atmosphere when Chip and Pepper there is infectious, they greet everyone who comes in with a loud cheer and applause. I hope it does stay, I like that its something different. My husband went for lunch and thought it was great! I can’t wait to try! 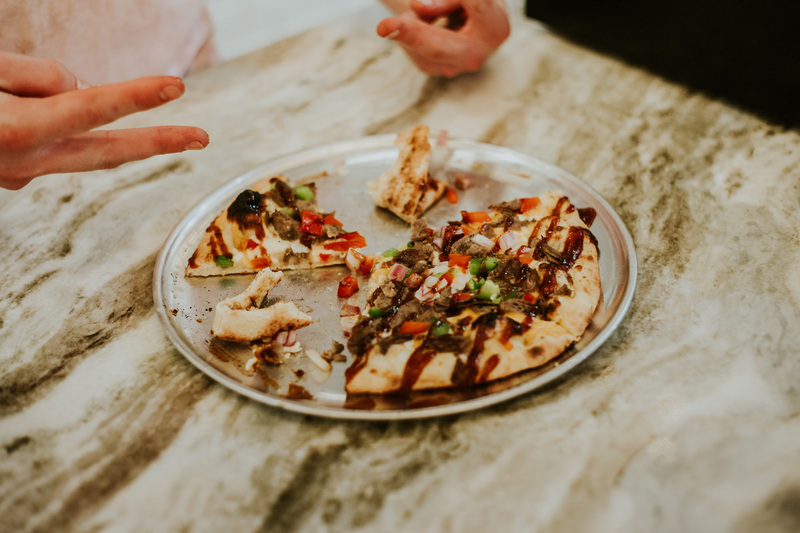 We tried the pizza it was amazing! Do you still have bands on the weekends?